Rāgamālā painting is a form of iconography that arose around 1600 in northern India. 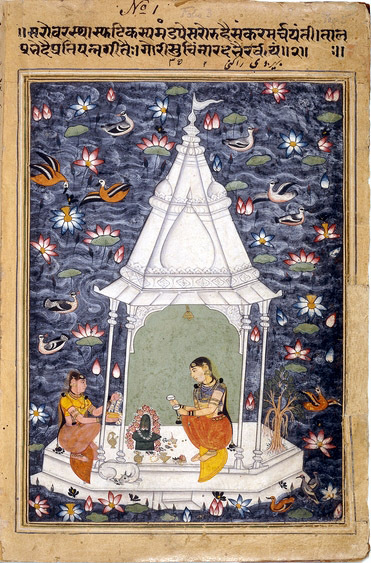 These visual depictions of rāgas involve the various extramusical associations that theorists have assigned to them; for example, this visualization of the Hindustani rāg bhairavī from about 1610 depicts women worshiping at a shrine to Śiva, embodying the rāga’s association with both Śiva and feminine energy, and evoking the colors of its traditional early-morning context. Below, the śahnāī player Bismillāh Khān (1915–2006) renders rāg bhairavī.